I have been working recently with Mark Urqhuart and his team at the You Yangs. The You Yangs really is shaping up to be a great recreational resource close to Melbourne. The park provides valuable space for a number of user groups to pursue their recreational activities. Besides the obvious walking, nature sights and picnic facilities, groups such as the horseriders, mountain bikers and us, the climbers can do what we love doing best. Following on from recent discussions please see the official announcement below regarding some great changes to a couple of areas at the You Yangs. 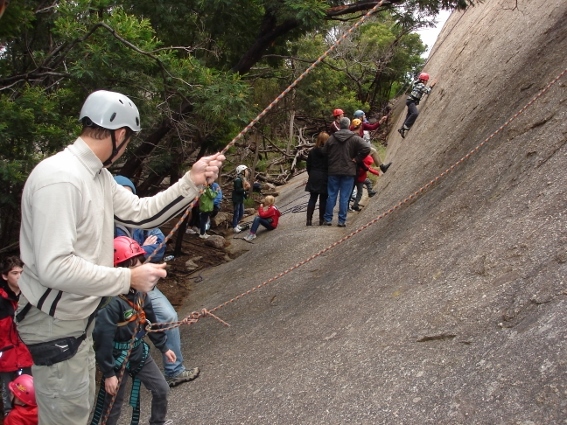 Parks Victoria has recently reviewed rock climbing arrangements at the You Yangs Regional Park. Through discussions with CliffCare, Licensed Tour Operators and park staff, a number of restrictions have been changed. These changes are consistent with the changes with the Parks’ usage, visitation and demand for recreational experiences, along with the absence of Peregrine Falcons from the east side of Flinders Peak for a number of years. The Sunday and Public Holiday closures to climbers on Big Rock has been removed. The permanent seasonal closure of sites on the east of Flinders Peak from August to November has been removed. A temporary closure of sites may be invoked if the birds return, with closures posted on site and within Argus. Further changes to increased access are being investigated and will be posted in due course. This entry was posted in Access &Environment officer reports, Parks Victoria updates & info, You Yangs and tagged access report, parks victoria, reopenings, rules and regulations, you yangs by Tracey. Bookmark the permalink.